In part 1 I covered the Stewart Southern from Regina to just north of Stoughton. 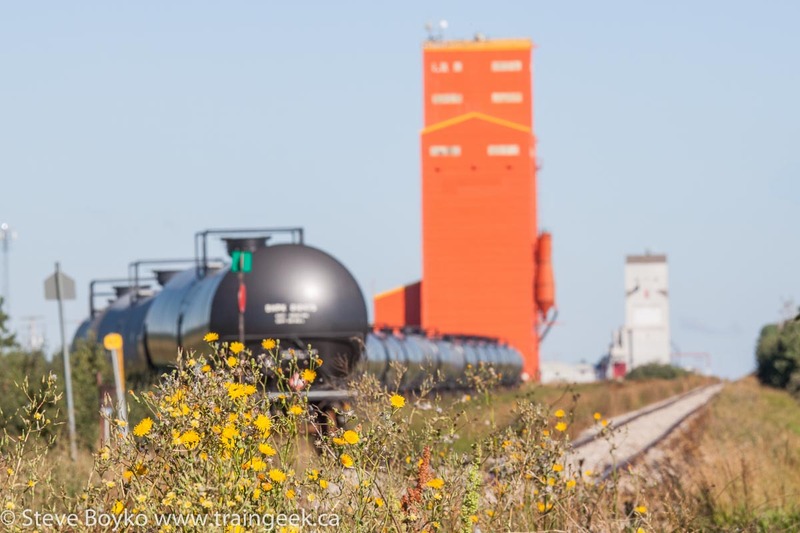 In part 2 I discussed the Crescent Point Energy oil transloading facility. 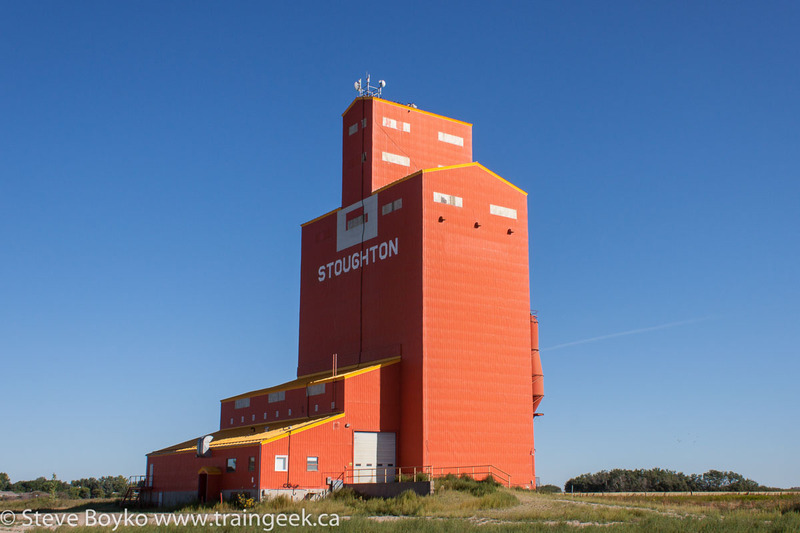 In this post we explore Stoughton and go back to Regina. 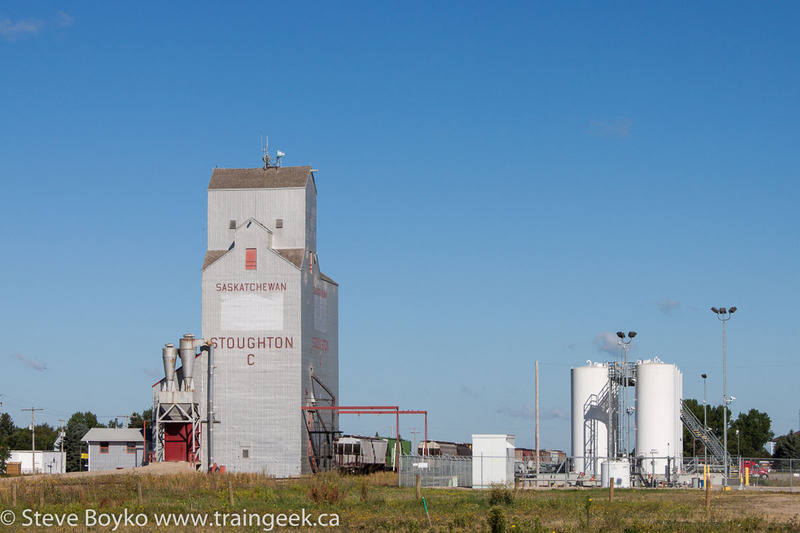 There are two grain elevators in Stoughton. In the town itself is a former Saskatchewan Pool grain elevator, "Stoughton C", indicating there was an "A" and "B" at one point. There were two grain cars spotted at the elevator and 11 more just north of the elevator. 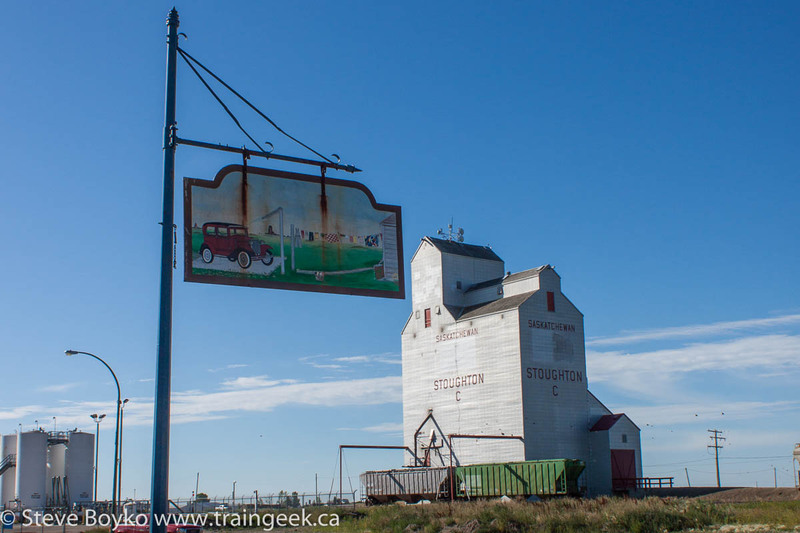 Just south of town, right before the end of the Stewart Southern's rails, is a former Pioneer grain elevator. Here's the end of the line. 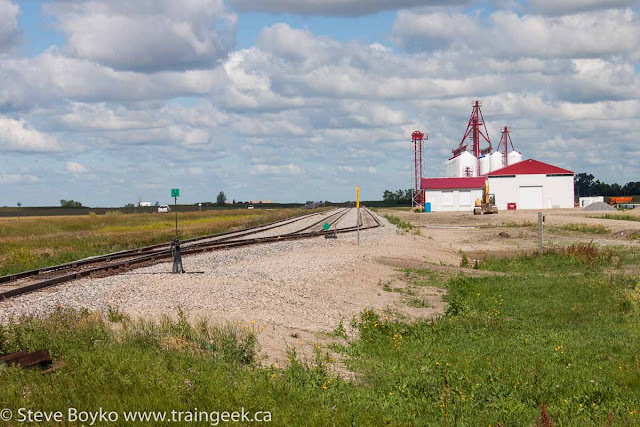 Note the tank cars stored on the siding. 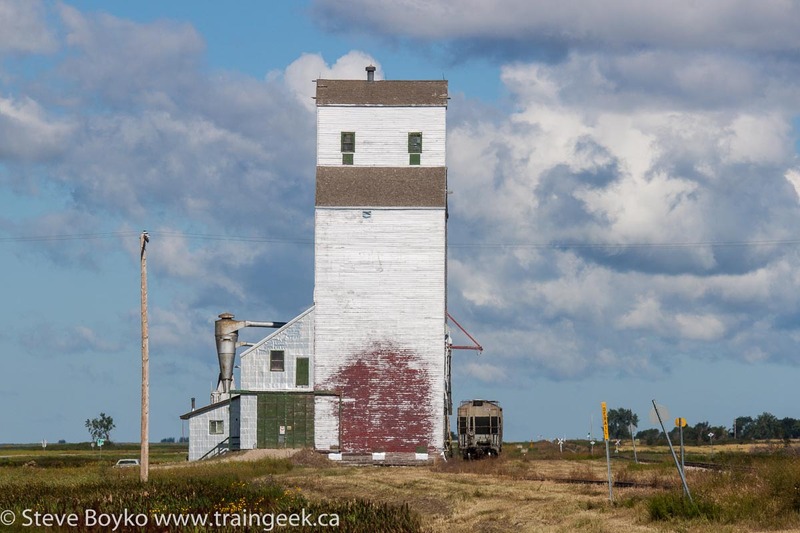 I'm guessing the ex Pioneer elevator is not in use any more. There's a golf course next to the Pioneer elevator, and I spotted a couple of fellows retrieving a ball. I asked one of them to pose for me. One more interesting thing in Stoughton is the three original Stewart Southern locomotives, stored on the former wye to the CP Kisbey subdivision. 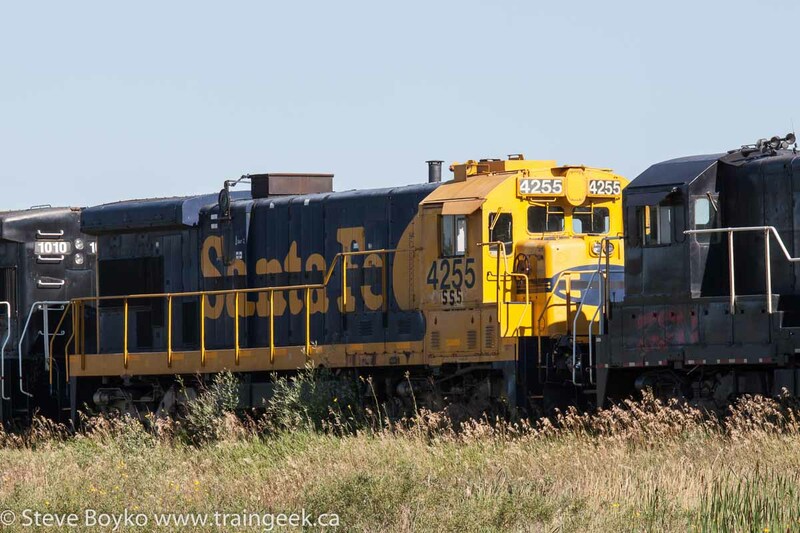 Stewart Southern's 1009 and 1010 are ex Savage Alberta Railway / Railnet units. 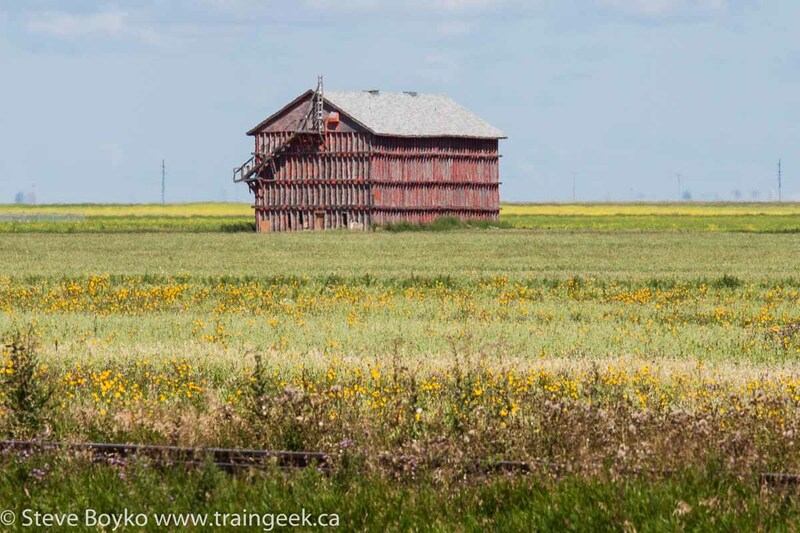 I spotted them in Regina in June 2009. They are GE B23-7 locomotives. 4255 is obviously ex Santa Fe and it was a new sighting for me. Back to Regina! But first, I had to grab those fogbound elevators now that the sun had come out. 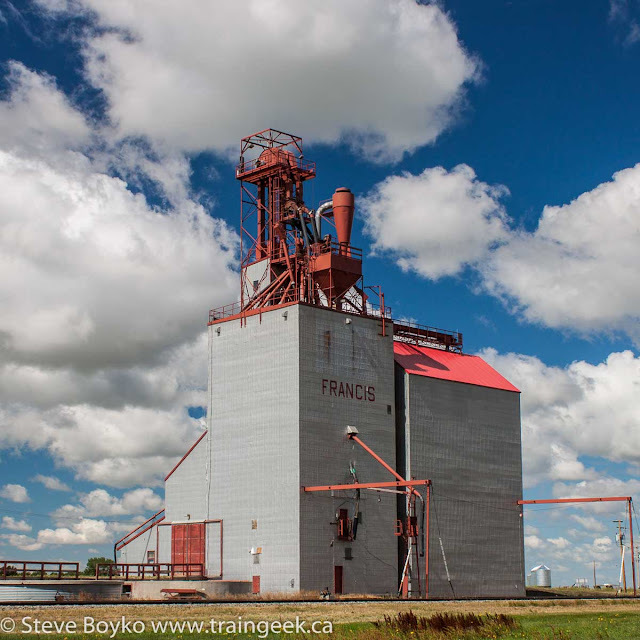 I already showed Creelman and Fillmore in the first post. I will point out this building just north of Fillmore. I think it is the Stewart Southern's shop building. The tracks lead into the two big doors. 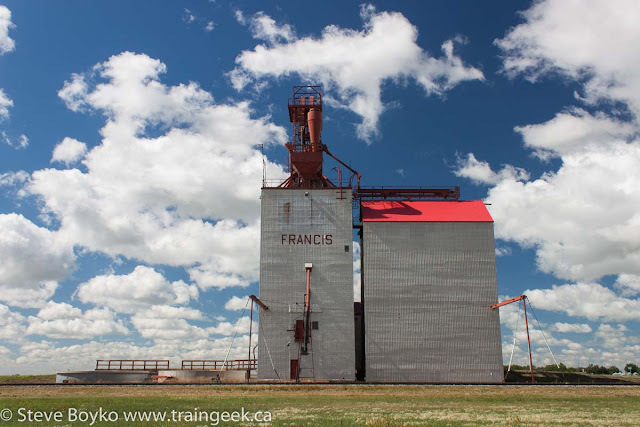 The Osage grain elevator is another ex Saskatchewan Pool grain elevator. When I saw this old Imperial Esso dealer sign, I had to include it with the elevator. Osage is just full of photo opportunities! I think the old paint is beginning to show through at the bottom. Maybe there was an annex there at one time. The Francis grain elevator clearly has a new roof on the annex, and was quite attractive once the fog lifted! I slapped my circular polarizer on my camera from here on to enhance that blue sky. 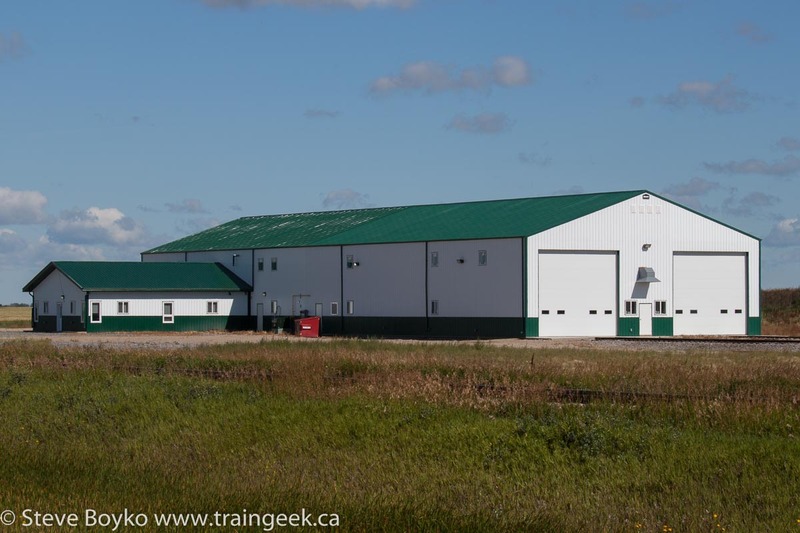 There's a facility just north of Francis that appears to be just finishing construction. I don't know what it is, as there aren't any signs around, but there is a pair of tracks beside it. 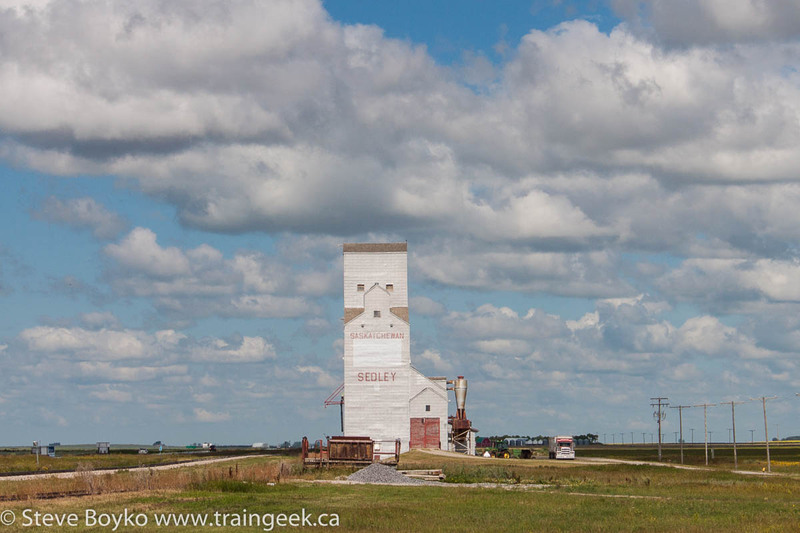 I just snapped a quick photo of Sedley, as I was getting short on time. 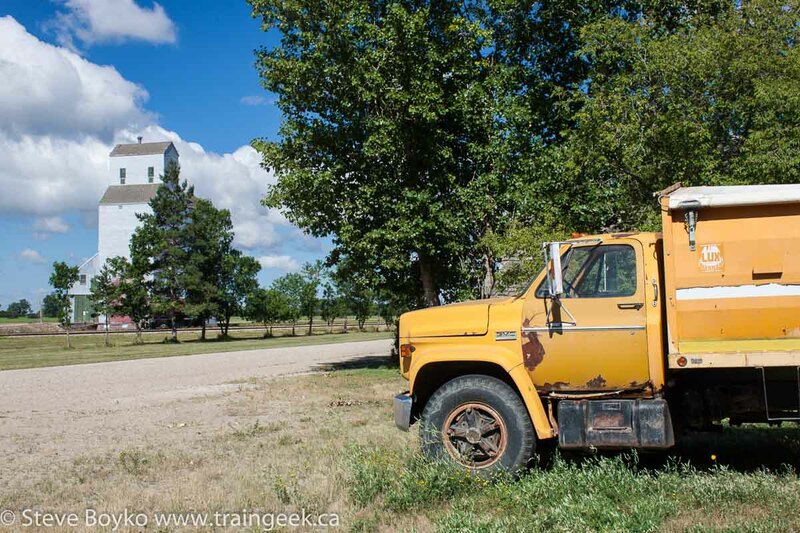 I spotted this just outside Richardson on the way back to Regina. 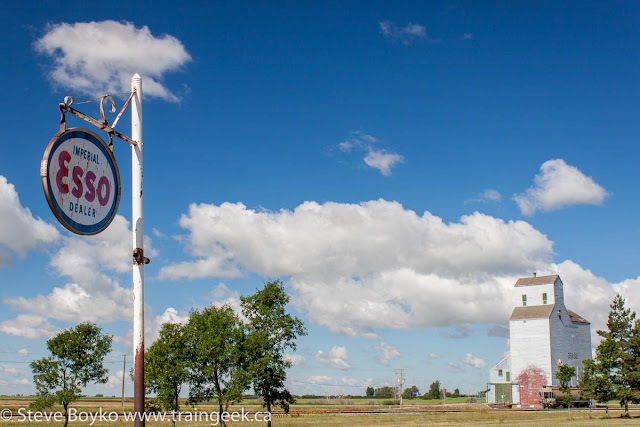 I think it is a grain elevator's "balloon" annex. That was the end of my tour of the Stewart Southern in Saskatchewan. I hope you liked the tour, and if you're in the area, check it out! Land of living skies! Great shots, but I particularly liked the golfer in front of the elevator. That is something you just don't see in these parts. Great series, Steve. Lots of activity still in that area! Thanks, Eric! Yes, still lots to see! What a great series Steve. My kind of stuff! That shortline seems to be doing well. That's one loooooong straight stretch of track.